Read any good books lately? No, I’m not talking about the latest crime novel or vampire thriller. I’m talking about a book that helps you grow as both a person and professional. I just finished a great book and I’d like to highlight a few of the things that I found most useful while reading it. The book is From Bud to Boss: Secrets to a Successful Transition to Remarkable Leadership by Kevin Eikenberry and Guy Harris. It brought together literally everything a new leader needs to know as they transition into their role. I’d like to think of it as a manager’s blueprint for success. Notice I didn’t say “new manager”. Why? Because it’s relevant to both new and veteran managers! Leadership development – whether you’re a new leader or a well-established leader, there’s something for everyone. As a leader, you must continue to develop your leadership style and understand how to effectively work with your team. Communication tips – everyone communicates differently. Knowing how to communicate effectively and knowing that there are different ways to communicate depending on that person’s style will help me and YOU become a better leader. A better understanding of my circle of influence – I now know what is in my power to influence and what’s outside of that circle. Change is inevitable, but setting the right expectations of your team and yourself is crucial in establishing influence. To quote the book, “People tend to live up (or down) to your expectations of them.” Are you setting realistic expectations? Advice as a new manager – I learned tips on how to celebrate progress (not just completion), how to handle resistance to change by others, how to be an effective coach providing feedback and feedforward. For the definition of feedforward, you’ll just have to read the book! Inspiration to be the best – all of the tips, tools and resources made available by this book makes me realize that this quote speaks true: “Destiny is not a matter of chance, it is a matter of choice; it is not a thing to be waited for, it is a thing to be achieved.” –William Jennings Bryan. We have to work hard to be the best. Having a thirst for knowledge and healthy dissatisfaction of the status quo will help us achieve our destiny. No one can do it for us. From Bud to Boss is a one-stop shop to find advice on Change, Coaching, Leadership, Management, Communication, Listening, Effective Presentations, and nearly everything you need to become a great leader , transitioning into your new role. This is a book that you can read cover to cover, or simply skim for the good nuggets of information. They’re in there – you just have to look. There’s even a reference to Star Wars Episode Six: Return of the Jedi (making me a bigger fan of Kevin and Guy than I was already). Two other great features of the book are Bonus Bytes and Now Steps in each chapter. Bonus Bytes expands the content beyond the printed word, taking you to their Bud to Boss Community, helping you put the philosophies and ideas into action in real life situations. The Now Steps are calls to action at the end of each chapter, asking you to reflect on what you’ve just learned and to take action in real life, applying the principles. 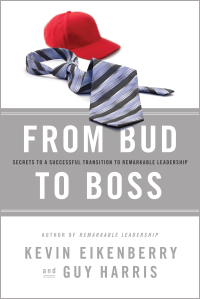 Kevin Eikenberry and Guy Harris’ book From Bud to Boss launches on Tuesday, February 15th. To celebrate the launch, they have gathered some terrific gifts from partners. To find out about the gifts, please visit http://www.frombudtoboss.com. I’ve also added this title to my Book List. You can check it out, along with other excellent leadership and job search resources. If you know someone who just got a promotion, is entering the workforce (think graduation gift), or has recently transitioned into a new leadership role, this is the book for them! FTC Disclaimer: This is my review of From Bud to Boss: Secrets to a Successful Transition to Remarkable Leadership, by Kevin Eikenberry and Guy Harris. In return for receiving the book in advance, I have been asked to give an honest review. The book can be purchased at http://launch.budtobosscommunity.com/ and other online retailers like Amazon, Barnes & Noble, Borders, and Books-A-Million. I do not receive any proceeds from the sale of the book or any other compensation. I’ve heard great things about ReWork, but haven’t read it yet. Will definitely add it to my “to read” list! I’ll check out your e-book. Thanks for the comment and book suggestion!